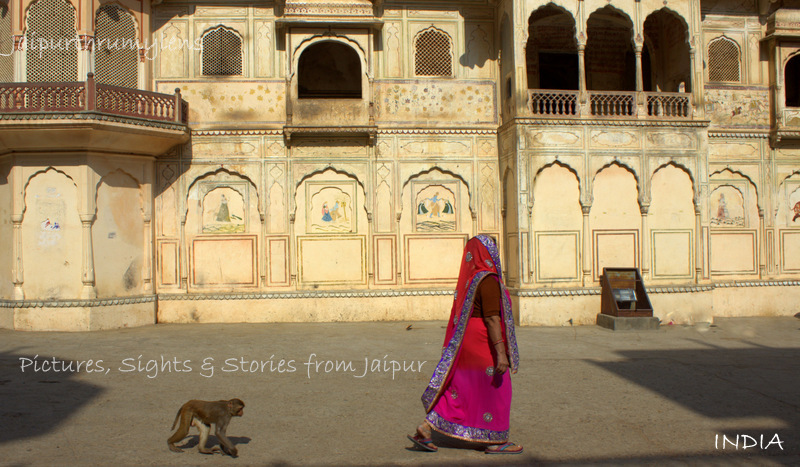 I recently undertook a heritage free walking tour in Jaipur in the old part of Jaipur city. Jaipur free walking tour was conducted to celebrate 288th Jaipur foundation Day. Certainly, this was a great effort to bring forth rich heritage of the Jaipur city! The Jaipur Heritage Walk was conducted on the most popular heritage walk way, developed by Jaipur Municipal Corporation. The heritage path is easily identifiable -it is laid with cobblestones. There are other individuals and organizations as well, offering similar heritage walk in Jaipur. The walk was led by Nischal Jain. The walk started at Shri Sitaram Temple located in Chaura Rasta . The temple is very old and is privately owned. We were informed that the temple predates Jaipur city. The condition of temple is poor and lack of upkeep is visible. The temple has not been renovated, ever. There are many unique aspects & stories about this temple. There are two temples buildings inside this complex.One of these, has beautiful wall paintings and frescoes. Sri Sitaram Temple, Chaura Rasta, Jaipur. Heritage walk in Jaipur. Second temple, inside Sri Sitaram Temple complex. Entrance to Sri Sitaram Mandir, Chaura Ratsa, Jaipur. Heritage walk in Jaipur. Next, we headed towards the film colony in Chaura Rasta. Nishchal Jain pointed out unique aspects of this location. The buildings located on the Main Square of film colony have been constructed in the Art Deco style, not found anywhere else in the walled city! It was developed as a commercial area with few hotels, as it was located near the entrance gate of the city – New Gate. Over the years, this market has developed into the medicine distributor’s hub. Jaipur Heritage Walk in Film Colony, Jaipur. Art Deco style building in Film Colony. Jaipur Heritage Walk. From film colony, we walked towards Thatheron ka Rasta. Thathera is a person who is engaged in making of metal utensils & objects.These days most of them are engaged in the making of brass items used in the temple spires. The sound of hammering on the brass was quite loud in the lane, proving true to its name – thatheron ka rasta!! One of the brass item being worked on. Jaipur Heritage Walk. Hammer used by Thatheras. Heritage Walk in Jaipur. As we moved forward, Nishchal Jain showed us various haveli styles & their development over a period of time, distinction between various haveli forms etc. Haveli Facade. Heritage walk in Jaipur. Different style & decorative pattern in window & wall on two floors. Jaipur Heritage walk. We passed through a very old Digamber Jain temple, supposedly as old as the city. We were informed that the temple is very beautiful and worth visiting. Our group didn’t venture inside the temple, due to paucity of time. From these lanes, we then walked towards the Maharajah School of Arts in Kishanpole Bazaar. The art school was operational till recently, but it is closed currently. Maharajahs of Jaipur were great patrons of art, especially Maharajah Sawai Jai Singh II and Sawai Ram Singh II. Establishing Art school only affirms their love for the art. Jaipur state (pre -Independence years) was famous for its Chattis Karkhanas (36 factories, in literal sense) or thirty six departments, during the days of Maharajahs, Art was one of them! Beautiful facade of Maharajah School of Arts & Craft, Kishanpole Bazar, Jaipur. The building housing the Art school has an impressive architecture. It has a fusion of various architectural styles including Rajput and Mughal style.It was originally a residence of Pandit Shiv Deen, but later converted into an art school. If plans go through, it will be converted into a museum, very soon. Maharajah School for Girls, near Nataniyon ki Haveli, Jaipur. We moved on to Chhoti Chaupar, where we saw the magnificent facade of Nataniyon ki Haveli and its adjoining Maharajah School for girls. This school building was donated by a very influential trader called Hargovind Natani, whose haveli is located right next to it. The haveli has an amalgamation of Rajput and Mughal style of architecture. Currently, its ownership rests with the Police Department. From Chhoti Chaupar we walked through Tripoliya Bazar to Maharajah Public Library in Chaura Rasta. On the way, we saw Ishwar Laat or Swarga Suli. Sargah Suli or Ishwar Laat towering over the Tripoliya Bazar, Jaipur. Nishchal Jain explained 3 different stories revolving around the construction of this Minaar or tower. We passed from Triployia Gate to reach the Maharajah Public library. It has been maintained in a great condition. Nishchal Jain took us inside the library and explained various aspects related to this building. Inside Maharajah Public Libarary, Chaura Rasta, Jaipur. Inside Maharajah Public Library, Jaipur. This is where the Heritage walk of Jaipur ended. For those who are curious as to why Tripolia Gate is closed for public here is the answer. Tripolia Gate is reserved only for the members of royal family of Jaipur; it’s not open for general public. The free Jaipur walking tour or Heritage Walk in Jaipur lasted one and half hour. Heritage walk is a great way to uncover the real Jaipur – its history and culture. A caveat though, given its rich and diverse history, a single walk is not enough to get a proper glimpse into the city. You need to discover more!! Such a fascinating place with such wonderful history and beautiful buildings. I would definitely love to visit one day. I think a walking tour is the best way to go to see everything close up. Great photos, lovely post. What a cool idea to tour Jaipur! You are right, architects can provide you with comprehensive insight into the various architectural features. And I’ve always been impressed with the architecture in India, so it is a nice way to learn a bit about the architectural features in Jaipur as well! Hey! happy to know that you are impressed with architecture of India. Walking is the best way to learn more about the city. Your Heritage walks in Jaipur are very impressive. As many bloggers give the glimpses of 5 star luxury resorts/palaces of Jaipu but you have taken offbeat path to show whole city which I liked it. Even you have covered Thateron kaa raasta which nobody has paid attention. Loved the pictures of simple homes of ancient styled balconies and walls. The walking tour seems like the best way to see Jaipur. It has such beautiful history and architecture. It’s nice to see a different side to Jaipur more of its heritage versus the luxury hotels. Thanks for sharing. Walking tours are always best way to explore the city…slow and nice! Have you ever visited Jaipur? Happy to hear that Jaipur ranks high on your list. It definitely ranks high on the list of tourist arriving in India.